The aim of the dissertation is to investigate the influence of corporate governance practices on firm performance of FTSE 100 companies. Explanatory variables belong to three categories, namely board parameters, CEO characteristics and ownership specifics. The period of investigation is 2005-2015. An analysis is conducted using a panel ordinary least squares regression and the Hausman specification test applied to determine whether a model with fixed or random effect is more appropriate to employ. The outcomes of the analysis expose board size, number of independent directors, firm size and crisis to be significant determinants of firms’ return on assets. Meanwhile no significant drivers are found for return on equity. Firm size appears to be a significant driver behind Tobin Q. At the same time, CEO remuneration and tenure, ownership concentration and affiliation of companies to either financial or non-financial sphere do not have a significant effect on firm performance. Along with that, the effect of the ratio of long-term debt to total assets taken as the control variable is also insignificant. These outcomes may be interesting for a broad range of market participants. Investors may use this information for better decision making. Executive managers may apply this data in routine managerial practices. Finally, non-performing may employ the outcomes of the research for understanding and enhancing mechanisms of corporate governance. Corporate governance (CG) is the process and mechanism by means of which the business is managed aimed at attaining firm well-being. La Porta et al. (2000) argued CG to be a range of tools using which external non-controlling investors secure themselves from power usurpation by the insiders. In this case, executive managers and controlling investors are considered as insiders as they have more information on the actual performance of the company and may utilise it in their own interests at the expense of small shareholders who have no power to affect corporate decisions (Nheri, 2014). The idea of CG indicates how a firm should be managed by those assigned responsible for strategic decisions and company prosperity. Since the division of ownership and executive functions among medium and large businesses, an issue of proper and sufficient control of managers by shareholders of the company has arose. Among the suggested mechanisms of control, a board of directors has become one of the most efficient systems of supervision and coordination of the work of a business (Manini and Abdillahi, 2015). In the absence of the board, insiders were the only power in managing a corporation while the opinions of small shareholders were often ignored. The board consists of executive top-managers such as Chief Executive Officer (CEO), Chief Financial Officer (CFO) and others and a number of non-performing (outsider, non-executive, NEDs) directors who are not directly engaged in company’s everyday activities but mostly play a role of supervisors and controllers of executives (Aluchna and Pindelski, 2014). Particular structure of the board remains an object of discussion. Thus, the central role of the board of directors in the establishment of the principles of effective CG in every firm should not be underestimated. The main target of implementing CG practices in a firm is to maintain and increase shareholder value by introducing mutually supportive mechanisms of control and stimulation of managers (Babic et al., 2016). A number of theories tried to explain the effect of CG on firm performance. Agency theory remains the most influential theory, suggesting that the board is mainly an instrument of control over executives. It also considers volume and structure of CEO payment as an incentive factor stimulating CEO to work for the increase of firm value (Naimah and Hamidah, 2017). At the same time, performance-linked remuneration is considered to be more effective than a salary that is paid independently on firm performance (Rahman and Bremer, 2016). Performance-linked payment means that a CEO is not paid only in cash but a share of the compensation is optional and depends on financial results of the company. Another option is partial payment of remuneration in the form of firm stock. In this case, a CEO should be interested in increasing stock value (Theeravanich, 2013). Besides agency theory, a number of other theories tried to shed light on other mechanisms that potentially improve firm performance. These include stewardship theory, resource dependency theory and stakeholder theory. Main statements of these theories are analysed in the literature review. CG practices are a very important tool of managing large companies. It includes different mechanisms aimed at enhancing the efficiency of firm performance, such as structure and size of director board; structure of ownership and the percent of shares belonging to the largest shareholder; and the terms of CEO’s work and the level and type of CEO remuneration. Therefore, it is important to understand which tools and particular mechanisms of CG provide the most considerable results in improving firm performance. Do controlling mechanisms or incentives contribute more to financial results of companies? Do other factors represented by control variables combined with parameters of CG procedures also influence firm profitability? Numerous researchers tried to answer these questions but the evidence was controversial. All these parameters were reported to have different influence on financial performance of companies depending on the explored sample, time period, employed variables and applied analytical methods. Therefore, the current study attempts to shed light on the significance of mentioned factors in the UK where CG practices have received wide distribution. Moreover, the most recent data are employed to indicate the latest tendencies in the influence of particular CG mechanisms on company profitability. The explored time period captures the times of the global financial crisis 2007-2009. This allows for understanding whether the trust in CG tools was shaken or these instruments are still perceived to be efficient regulators of company performance. Finally, the sample includes companies from the FTSE 100 index. To the opinion of the author, the largest UK companies most clearly represent the regulatory power of CG because of the size, volume of assets of these companies and their influence on performance of financial markets of the UK. - to assess the influence of ownership structure on firm profitability. The rest of the dissertation is structured as follows. Chapter 2 overviews the body of existing literature on the effect of CG procedures on firm performance. Chapter 3 is dedicated to the specification of methodology of the study including research design, specifics of the data sample, particular analytical methods applied in the investigation, research hypotheses and a working model for testing the hypotheses. Steps of analysis and its outcomes are reported in Chapter 4. Finally, Chapter 5 sums up the results of the study and discusses them in the light of the existing knowledge on the influence of CG on firm performance. A number of board parameters has been studied most comprehensively including board size, board structure and gender diversity. The evidence of the effect of these parameters on firm performance is mixed. Ansah (2015) explored the association between procedures of corporate governance and productivity of mutual funds in Ghana within 2008-2013. No substantial effect of board size, board structure and firm size on profitability was exposed. At the same time, a significant positive impact of periodicity of corporate board sessions and corporate profitability, showing that boards that have larger number of meetings are likely to perform better. At the same time, gender diversity was found to have a significant negative influence on firm performance. Unlike these outcomes, the paper of Habib (2016) showed that the presence of female directors had a positive impact on firm profitability. Along with that, tenure of directors and remuneration of board members appeared to positively influence firm performance as well. However, another controversial result was found, namely a negative effect of board size on profitability represented by return on assets (ROA) while this effect was positive in the paper of Ansah (2015). At the same time, this result is opposite to the one reported by Vo and Nguyen (2014) who exhibited a positive impact of that factor. This result was confirmed by Guo and KGA (2013) who underlined a negative influence of board size on firm profitability. The latter authors also exhibited a negative influence of the number of non-executive directors on ROA. The difference of the reported results from those provided by Ammari et al. (2014) is that the latter used several variables to represent profitability, namely return on assets, return on equity (ROE), Tobin Q ratio and market-book-ratio. In overall, the effect of board structure proxied by board size, board independence and the overall functions of decision making and supervision on firm performance was found to be positive. This means that different parameters of director board can be significant determinants of financial performance of companies. However, the findings of Fuzi et al. (2016) questioned the effectiveness of non-executive directors as an instrument of corporate control over managers. The outcomes of the study exposed a heterogenous relationship between share of non-executive directors and firm profitability. Companies with largest share of non-performing directors did not indicate the highest profitability in the sample. The authors made a conclusion that the presence of non-executive directors on board was a subject of control in order to exhibit positive owner values. The paper of Sun et al. (2013) explored whether firm profitability in the US insurance sector is significantly influenced by CEO remuneration. The outcomes exhibited a positive and significant relationship between firm profitability and CEO compensation. A similar result was indicated by Raithatha and Komera (2016) in a sample of Indian listed firms employing GMM estimator as an analytical method. Yet, this result was exhibited to be true only for large firms while the effect of CEO income appeared to be insignificant for the companies of smaller size and business group affiliated firms. Thus, a conclusion can be made that the association between CEO pay and firm performance depended on the ownership structure and firm size in the sample examined by the authors. Other aspects of the CEO pay-performance relationship were analysed by Abedin (2015). The author showed that growth of firm productivity was positively influenced by CEO compensation if a greater share of overall remuneration was tied to performance of the company and was paid out in the form of stock options and packs of shares. Besides, larger remuneration and higher productivity were also associated with higher inclination of risk taking. The author emphasized that the outcomes of his study supported the standpoint that CEO remuneration should be connected with performance of the firm in order to reduce agency costs and facilitate the solution of agency issues between managers and shareholders. Fallatah (2015) confirmed the relevance of the “Pay for performance” principle on the sample of the companies listed at the Saudi Stock Exchange within 2008-2012. He also showed a significant relationship between CEO compensation and firm profitability. However, the researcher did not differentiate the CEO compensation into performance-linked and base parts. However, the result reported by Kazan (2016) appeared to contradict with those previously indicated in the academic literature. The analysis of Scandinavian listed firms within the period 2000-2016 showed a negative relationship between CEO remuneration and firm performance represented by ROA and ROE. Moreover, this effect of CEO pay was exhibited as insignificant whereas previous studies argued this impact to be significant. It is noteworthy, not all authors stick to the point of view that agency theory is still relevant for interpreting CEO remuneration mechanisms and has a substantial explanatory power. Sarkar (2013) introduced an enhanced model which took into account all adjacent variables used for explaining relationship between CEO pay and corporate profitability. Along with firm-specific parameters, the suggested model comprised of political aspects, dimensions of social networking, human capital and social fairness. Similar with Ammari et al. (2014), ROA, ROE and market-to-book value ratio with the additional variable market value added were employed as proxies of profitability by Asadi and Pahlevan (2016). The researchers revealed different determinants of those proxies of firm performance in the different ownership structures. In addition, the authors found a confirmation for the initial hypothesis that ownership structure of firms in different sectors entailed substantial difference in productivity evaluation indexes. These findings were made for the companies listed at the Tehran Stock Exchange for the period 2007-2011. Unlike the previous paper, Suman et al. (2016) used only ROA to represent firm performance. Along with that, overall ownership concentration and managerial, institutional and foreign ownership were employed as the possible explanatory variables of productivity. The specific of the paper is that firms from particular industries, namely textiles, oil marketing and distribution and movies and entertainment industries and traded at the Bombay stock exchange were explored by means of panel regression analysis. The outcomes of the study showed only ownership concentration, which is the percentage of shares owned by the largest stockholder of any type to be a significant driver behind firm profitability. At the same time, particular forms of ownership did not have a significant effect of firm performance. This result was partly confirmed by Abeyrathna and Ishari (2016) who also found institutional ownership to have no significant impact on firm performance for the sample of manufacturing firms in Sri Lanka. The distinction of this study from the previous ones is that only two variables of ownership structure were used as key independent variables, namely block ownership and institutional ownership. Both variables appeared to be insignificant determinants of profitability proxied by ROE. What is noteworthy, the impact of block ownership was negative while the influence of institutional ownership was positive. However, Manna et al. (2016) exposed foreign ownership to have a significant and positive impact on firm performance for a set of Indian listed companies which contradicts with the findings of previously mentioned papers. The similarity of the current study with the one conducted by Manna et al. (2016) is that variables from different dimensions were employed in attempt to explain firm performance. At the same time, the researchers did not use traditional proxies of profitability such as ROA and ROE, having replaced them by Tobin’s Q, market value added, cash earnings per share and return on capital employed. Besides the variables of ownership concentration and foreign ownership, other potential determinants of firm profitability were used. These included board size, board structure, CEO duality, CEO tenure and CEO compensation. However, only board size and foreign ownership were found to have a significant impact on more than one dependent variable. The data for the analysis such as figures from financial statements and information on the board parameters are taken from the Thomson One Banker database. This is a reliable source used by many investors for making justified and thorough decisions. The information contained in this database is collected and renewed permanently. Therefore, this source can be perceived trustworthy. The period of analysis is 2005-2015. This allows for employing a large data sample sufficient for making quality statistical analysis. At the same time, the chosen period allows for using the most recent data from financial statements of the FTSE 100 companies and thus reflect the current tendencies in the relationship between CG procedures and firm performance. The stages of analysis include the analysis of descriptive statistics; analysis of correlation matrix; and, panel regression analysis. Descriptive statistics used in the analysis are mean, minimum and maximum values and standard deviation. This allows for understanding the boundary values of the variables. Analysis of correlation matrix is made in order to determine the potential presence of multicollinearity in the sample. Multicollinearity is a phenomenon when a behaviour of one explanatory variable can be to a large extent predicted using the values of another explanatory variable. In this case, a high correlation between two explanatory variables can be observed. The threat of this situation is that if these variables appear to have a significant influence on the dependent variable as well, it would be difficult to isolate the separate effect of these variables on the dependent variable. Therefore, a significant explanatory variable may, in fact, be insignificant taken alone. To avoid this situation, if a strong correlation between any two dependent variables is detected, one of the variables may be omitted form the model. Correlation between the independent variables is estimated using the Pearson correlation coefficient. It takes the values within the interval [-1;1]. The extreme values of this spectre, namely -1 and 1, indicate the presence of perfect correlation between two variables. The value -1 would imply negative correlation which means that if one increases the other one exposes a decrease. At the same time, a value of the coefficient equal to 1 means that an increase in one variable is connected with an increase in the other variable. A value of the coefficient close to 0 means that correlation between the variables is absent or very weak. The significance of the effect of explanatory variables on dependent variables is estimated using the t-tests. In this test, a null hypothesis is that the relationship between the variables is insignificant. Next, a p-value of the t-statistic is compared to the threshold value. The 5% significance level is accepted for the study which means that there is a probability of 95% that this relationship holds while only 5% that it is not true. For the chosen significance level the threshold value is 0.05. If a p-value is higher than 0.05 this means that the null hypothesis should be taken and a factor represented by an independent variable does not have a statistically significant impact on the explored phenomenon represented by a dependent variable. In the opposite case, when a p-value is lower than 0.05 this means that the null hypothesis should be rejected and the alternative hypothesis should be taken. In this case, the effect of an independent variable on a dependent variable appear to be significant. A panel regression analysis is conducted as there are two dimensions in which data changes, namely years and companies. Therefore, pooled OLS regression which would admit the changes in data in only one dimension and turn the data into a cross-section sample or time series, cannot be employed. - H03: specific conditions of CEO work do not have significantly affect firm performance. 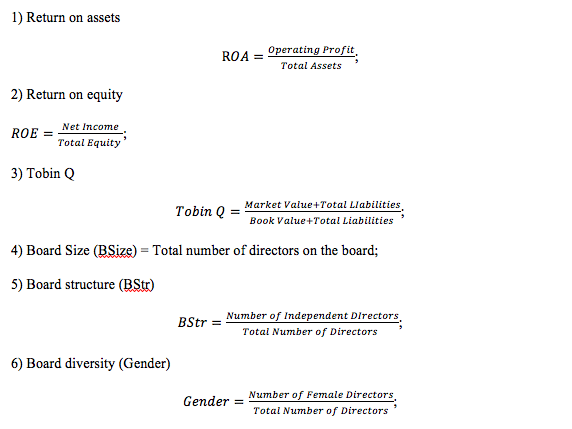 ROA is return on assets, ROE is return on equity, Tobin Q is Tobin’s coefficient, BSize is the of board of directors, Gender is gender diversity, BStr is board structure, OC is ownership concentration, CEOpay is CEO payment, FSize is firm size; DA is debt-to-assets ratio, Crisis is the dummy variably indicating the period of crisis, Fin is the dummy variable indicating whether the company represents the financial sector, β0 is the intercept, β1- β10 are slope coefficients, εt is the error term. A panel regression is run for three variants of the empirical model for each of the dependent variables employed in the study. Moreover, it is important to determine a model with which types of effects is more appropriate for explaining the data. Both types of effects take into account unobserved factors that may have an influence on A model with fixed effects (FE-model) takes into account these effects by creating a dummy variable for each cross-section. It provides more consistent and unbiased coefficients but significantly decreases the number of degrees of freedom. Therefore, it is more appropriate for large samples. Meanwhile, a model with random effects (RE-model) takes into account all these specifics of the cross-sections by averaging them into one variable with its own error term. Hausman specification test shows which of the two models better explains the data in the sample. The outcomes of a panel regression analysis and Hausman test for all three models are discussed in the following sections. The outcomes of the analysis of the FE-model with ROA as a dependent variable showed board structure, firm size and CEO tenure to be significant determinants of firm profitability at the 1% level whereas ownership concentration is significant at the 5% level. While tenure affects firm profitability positively, number of independent directors, firm size and ownership concentration have a negative impact on ROA. 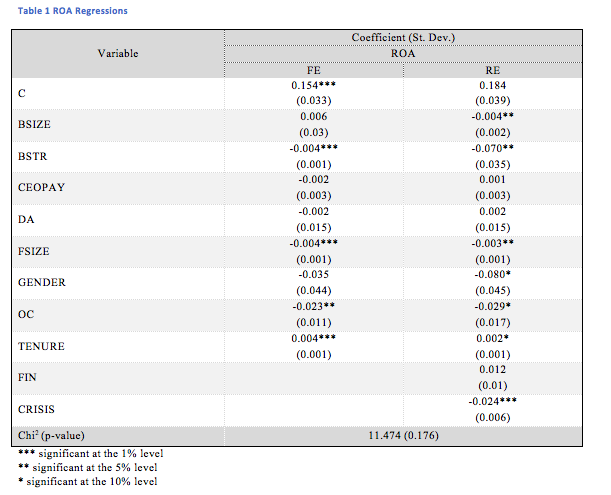 All other variables appear to have no significant on ROA (Table 1). As for the RE-model, both dummy variables were employed as potential determinants of firm profitability. The results show board size, board structure and firm structure to be significant at the 5% level while the crisis variable is significant at the 1% level. Also, gender diversity, ownership concentration and CEO tenure are significant at the 10% level. The effect of CEO tenure is positive while the effect of other significant variables is shown to be negative. Hausman test is applied to determine more appropriate model for the explanation of the outcomes of the analysis. The key indicator of the Hausman test is the p-value of the chi2. As the 5% significance level is accepted in the study, the threshold value is 0.05. If the p-value of the chi2 is lower than this value, the null hypothesis of the test that RE-model is more appropriate for the study is taken. Otherwise, an alternative hypothesis that RE-model better explains the data should be accepted. The p-value of the chi2 of the model with ROA as the dependent variable is 0.176 which means that the null hypothesis should be taken. This, in turn, implies that the RE-model better fits the data. Board size, number of non-executive directors and firm size appear to influence firm performance negatively. That is, higher profitability level can be observed in companies where the overall amount of directors on the board and the amount of non-executive directors is relatively low. The explanation may be that the board and the number of independent directors increases when company grows as its business complicates and needs more expertise and control. Larger companies have larger amounts of assets, particularly non-current assets such as plants and equipment. However, larger companies are usually stable companies with lower growth and profitability rates than those of smaller growing companies. Large companies have lower profitability because of large expenses for infrastructure. Therefore, a larger number of directors is connected with smaller profitability. Thus, agency theory and resource dependency theory have no confirmation by the outcomes of the analysis of this model. Ownership concentration also has a negative effect on profitability. The aim of large shareholders is not receiving maximum profit in a short-term perspective but maintaining the current status quo and keep control over company. While it increases stability of the business and decreases risks of insolvency or bankruptcy, it also decreases stimuli to take additional risk and undertake risky projects with potentially higher profit. This is likely to be an explanation of a negative association between ownership concentration and firm profitability. At the same time, CEO tenure plays a positive role in enhancing firm performance. Larger tenure is also connected with stability of business as a long-working CEO knows the company better and thus has higher ability to better control it. At the same time, agency conflicts are likely to be less probable within longer CEO tenure whereas not board of directors often changes significantly given frequent changes of CEOs. This finding is likely to be in line with agency theory. Number of female directors is negatively connected with ROA. The theory predicts that presence of women on the board may positively affect performance because of different style of thinking and irrational decisions that may be more effective than ordinary “male” decisions based on standard logic (Habib, 2016). However, the evidence, on the contrary, reports that a growth of number of female directors is connected with a decrease in profitability. However, it is important to note that the effect of the latter two variables is significant only at the 10% level. Therefore, it is considered insignificant in this study. Meanwhile, crisis dummy variable has a significant impact on firm performance at the 1% level. This finding is an expected one as it means that firm profitability considerably decreased within the period of the crisis. Indeed, the financial crisis 2007-09 led to a decrease in stock prices and firm profitability of businesses around the world and all largest financial markets have also been influenced. 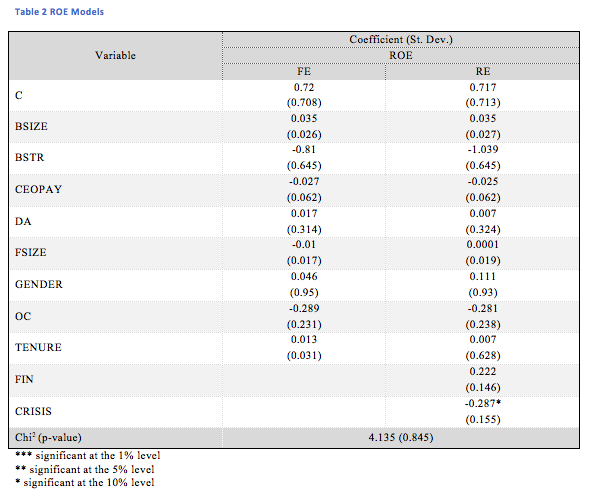 Surprisingly, both FE- and RE-model appear to have no significant coefficients when ROE is taken as the dependent variable (Table 2). Therefore, there is no substantial difference in explanatory power of the two variants of the model. Moreover, their explanatory ability does not differ from the model containing only the constant and no coefficients at all and therefore known as the intercept-only model. The difference between ROA and ROE in this study is that net income is compared with total assets and firm equity, respectively. Equity is equal to total assets adjusted for total liabilities of the firm. One may conclude that firm assets and liabilities are more predictable figures following some trends while the value of equity is less predictable and more chaotic. At the same time, trends can be seen in the behaviour of independent variables employed in the study. As the values of equity are less predictable, the values of ROE are also less predictable than those of ROA. This may explain the absence of significant effect of independent variables on ROE. Board size, firm size and ownership concentration appear to be significant determinants of firm performance represented by Tobin Q in the model with fixed effects (Table 3). These variables are significant at the 1% level. At the same time, board structure is significant at the 5% level whereas CEO remuneration is significant at the 10% level. The effect of board size, number of independent directors, ownership concentration and firm size is shown to be negative while the impact of CEO pay is positive. Meanwhile, CEO tenure, gender diversity and the ratio of long-term debt to total assets do not have a significant impact on Tobin Q in the FE-model. As for the RE-model, number of non-executive directors is significant at the 10% level while company size represented by the logarithm of total assets is significant at the 5% level. The effect of both variables is negative. The p-value of the chi2 in the Hausman test is equal to 0.425 is higher than 0.05. This means that the null hypothesis of the test should be accepted and the RE-model should be chosen. This means that only firm size is a significant driver of Tobin Q while the number of non-executive directors is significant at the 10% level. The sign of the relationship between number of independent directors and Tobin Q is negative. Meanwhile, the main element of the Tobin Q formula is market capitalisation of the company. The larger is the market capitalisation, the higher is company’s Tobin Q. At the same time, total assets are in the divisor of the Tobin Q formula. On the contrary, if total assets grow, Tobin Q decreases. A negative association between firm size and Tobin Q means that increase in the number of independent directors on the board leads to a decrease in the ratio of market capitalisation to total assets. That is, when number of directors increases, the degree of market overvaluation compared to firm’s total assets declines. Descriptive statistics exposed that the average value of Tobin Q for FTSE 100 companies is over 3 which means that the stocks of these companies are overvalued by 3 times. This means that increase in board size due to increase in the number of non-executives entails a reduction of this overvaluation. On the one hand, it decreases firm value but on the other hand, it moves stock price closer to the fundamental value predicted by financial statements. In other words, a decrease in the number of non-executive directors leads to a growth of market capitalisation. In the current situation, a decrease in market value may be to some extent useful for the entire market as it prevents “overheating” of the market and the depth of potential crisis in the future. At the same time, firm size is also negatively associated with Tobin Q. The relationship is direct as total assets are included in the Tobin Q formula in the divisor. The outcomes of the analysis are in line with those provided by Habib (2016) and Guo and KGA (2013) who also revealed a negative impact of board size on firm performance. At the same time, a majority of authors such as Ansah (2015) and Vo and Nguyen (2014), argued the effect of overall number of directors on firm ROA to be positive. One can see that the evidence on the relationship between board size and ROA are rather mixed which can depend on the chosen samples and analysed time periods. One can say that the outcomes of the study are contrary to those reported by Ammari et al. (2014). The authors also used several proxies for company performance and several parameters of the board to indicate whether board characteristics affected firm profitability. They argued that, overall this effect was positive, whereas this study showed this effect to be negative. Fuzi et al. (2016) partially confirmed the outcomes received in this study as they also argued the effect of increase in the number of independent directors to be disputable. The outcomes of the current analysis in the dimension of CEO characteristics differ from those provided by numerous researchers. The matter is that almost all of them insisted the “pay-performance” relationship to be positive and significant (Fallatah, 2015; Raihatha and Komera, 2016). This means that larger CEO remuneration was connected with better firm profitability. Abedin (2015) added that better performance could be gained only if larger share of CEO compensation was directly linked to firm performance. These results were in line with agency theory. Only Kazan (2016) argued the association between CEO pay and firm performance to be negative. Meanwhile, the current study found no significant relationship between CEO compensation and different proxies of firm productivity. In the dimension of ownership specifics, the current study explored only the common effect of ownership concentration on firm performance without taking into account ownership of companies by foreign and institutional investors. While Suman et al. (2016) and Ammari et al. (2014) showed ownership concentration to be a significant driver of firm performance, the current study found this effect to be insignificant. This refers to all three explored models with ROA, ROE and Tobin Q as dependent variables. The main limitation of the study is the incompleteness of the data sample. While the data on board parameters and CEO characteristics was available in a full volume, data on financial indicators was only partial. This could have distorted the significance of the effect of explanatory variables on dependent variables. Another drawback of the employed data sample is that data on ownership concentration was available only for 2015 and was assumed to be constant within the whole period of analysis. A sufficient number of companies in the sample was enough to receive the outcomes of the regression but they look less relevant for this variable compared to the outcomes of the regression for variables with full data available. Future studies can be recommended to divide the sample into subsamples to receive more homogenous although smaller sub-samples. Examples of this division could be the following. The outcomes of the analysis of samples for financial and non-financial companies could be received which would allow for differentiating significant drivers of performance for companies of both types. Another variant of division could be isolation of pre-crisis and post-crisis periods which would show whether the same factors were significant in enhancing firm productivity before and after the crisis. Finally, several groups of companies could be marked out in the sample in accordance to their size. Descriptive statistics showed that the difference in asset volume for largest and smallest companies in the sample was about 50 times. Companies of so different size could apply different technologies of business and therefore different drivers of their successful performance. Abedin, M. Y. (2015) Effect of Executive Compensation on Firm Performance, Thesis Submitted in Fulfillment of the Requirements for the Degree of Master of Science in Management (Finance) Goodman School of Business, Brock University, St Catharines, Ontario. Abeyrathna, G. M. and Ishari, S. (2016) Impact of Ownership Structure on Firms’ Performance of Manufacturing Companies in Sri Lanka, International Journal of Scientific and Research Publications, 6 (10), pp. 111-115. Aluchna, M., Pindelski, M. (2014) Corporate governance in founders’s controlled companies, In Dover, P., Hariharan, S., Cummings, M., (ed). Proceedings of the 2nd International Conference on Management, Leadership and Governance, Babson College Wellesley, Massachusetts, USA, 10-17. Ammari, A, Kadria, M. and Ellouze, A. (2014) Board Structure and Firm Performance: Evidence from French Firms Listed in SBF, International Journal of Economics and Financial Issues, 4 (3) pp. 580-590. Babic, V. M., Nikolic, J. D. and Stanisavljevic, M. S. (2016) Corporate governance mechanisms effectiveness: the case of transition countries, Facta Universitatis Series: Economics and Organisation, 13 (2), pp. 161-175. Badara, M. S. (2017) The Relevant of Contingency Theory and Stewardship Theory on the Internal Audit Research, Journal of World Economic Research, 6(2), pp. 17-22. Badara, M. S., and Saidin, S. Z. (2014) Empirical evidence of antecedents of internal audit effectiveness from Nigerian perspective, Middle-East Journal of Scientific Research, 19 (4), pp. 460-471. Berle, A. A. and Means, G. G. C. (1932) The Modern Corporation and Private Property, Transaction Books. Bryman, B and Bell, E. (2015) Business research methods, (4th ed. ), Oxford: Oxford University. Press. Cormier, D., Magnan, M. and Velthoven, B.V. (2005) Environmental Disclosure Quality in Large German Companies: Economic Incentives, Public Pressures or Institutional Conditions? European Accounting Review, 14 (1), pp. 3-39. Endaya, K. A. and Hanefah, M. M. (2013) Internal audit effectiveness: An approach proposition to develop the theoretical framework, Research Journal of Finance and Accounting, 4 (10), pp. 92–102. Fallatah, Y. A. (2015) CEO Compensation, Firm Performance and Corporate Governance: An Empirical Investigation of Saudi Arabian Companies, MAGNT Research Report, 3 (6), pp. 43-71. Fama, E. F. and Jensen, M. C. (1983) Agency Problems and Residual Claims, Journal of Law and Economics, 26(2), pp. 327-349. Freeman, R. E. (1984) Strategic management: A stakeholder approach, Boston: Pitman. Glinkowska, B. and Kaczmarek, B. (2015) Classical and modern concepts of corporate governance (Stewardship Theory and Agency Theory), 19 (2), Available at: https://www.degruyter.com/view/j/manment.2015.19.issue-2/manment-2015-0015/manment-2015-0015.xml, [Accessed on 01/09/2017]. Guo, Z. and KGA, U. K. (2012) Corporate Governance and Firm Performance of Listed Firms in Sri Lanka The 2012 international (spring) Conference on Asia Pacific Business Innovation and Technology Management, Procedia - Social and Behavioural Sciences, 40, pp. 664 – 667. Habib, M. A. (2016) Relationship between Corporate Governance and Firm Performance: A Case Study in Bangladesh, International Scholar Journal of Accounting and Finance, 2 (1), pp. 11-20. Jensen, M. C. (2001) Paying People to Lie: The Truth About the Budgeting Process, Available at: http://papers.ssrn.com/paper=267651, [Accessed on 01/09/2017]. Jensen, M. C., and Meckling, W. H. (1976) Theory of the Firm: Managerial Behaviour, Agency Costs and Ownership Structure, Journal of Financial Economics, 3(4), pp. 305-360. Kazan, E. (2016) The impact of CEO compensation on firm performance in Scandinavia, 8 th IBA Bachelor Thesis Conference, November 10th, 2016, Enschede, The Netherlands. La Porta, Rafael, Florencio Lopez-de-Silanes, Andrei Shleifer, and Robert Vishny (2000) Investor protection and corporate governance, Journal of Financial Economics, 58 (1–2), pp. 3–28. Madison, K., Holt, D. T., Kellermanns, F. W. and Ranft, A. L. (2016) Viewing Family Firm Behavior and Governance Through the Lens of Agency and Stewardship Theories, Family Business Review, 29 (1), pp. 65–93. Manini, M. M. and Abdillahi, U. A. (2015) Corporate Governance Mechanisms and Financial Performance of Commercial Banks in Kenya, IOSR Journal of Business and Management, 17 (3), pp. 25-40. Manna, A., Sahu, T. N. and Gupta, A. (2016) Impact of Ownership Structure and Board Composition on Corporate Performance in Indian Companies, Indian Journal of Corporate Governance, 9 (1), pp. 44-66. Naimah, Z. and Hamidah, R. (2017) The Role of Corporate Governance in Firm Performance, SHS Web of Conferences, 34, pp. 34-40. Nheri, O. (2014) Economic reforms, corporate governance and privatization method as determinants in performance changes of new privatized firms: the case of MENA countries, Journal of Management and Governance, 18, pp. 95–127. Ninlaphay, S. and Ngamtampong, N. (2013) Internal control effectiveness and stakeholder credibility performance: Evidence from corporate governance awarded firms in Thailand, Journal of International Business and Economics,13 (3), pp. 173-186. Pfeffer, J., and Salancik, G. R. (1978) The External Control of Organizations: A Resource Dependence Perspective, New York: Harper and Row. Rahman, K. M. and Bremer, M. (2016) Effective corporate governance and financial reporting in Japan, Asian Academy of Management Journal of Accounting and Finance, 12 (1), pp. 93-122. Raithatha, M. and Komera, S. (2016) Executive Compensation and Firm Performance: Evidence from Indian firms, IIMB Management Review, 28 (3), pp. 160–169. Rezaee, Z. (2017) Corporate Sustainability: Theoretical and Integrated Strategic Imperative and Pragmatic Approach, The Journal of Business Inquiry, 16 (1), pp. 60-87. Sekaran, U. (2003) Research Methods for Business: A Skill-Building Approach, 4th ed., John Wiley and Sons. Suman, S. S.., Basit, A. and Hamza, S. M. (2016) The Impacts of Ownership Structure on Firm Performance, International Journal of Accounting and Business Management, 4 (2), pp. 262-271. Sun, F., Wei, X. and Huang, X (2013) CEO Compensation and Firm Performance: Evidence from the US property and liability insurance industry, Review of Accounting and Finance, 12 (3), pp. 252 – 267. Theeravanich, A. (2013) Director Compensation in Emerging Markets: A Case Study of Thailand, Journal of Economics and Business, 70 (C), pp. 71-91. Villalonga, B., Amit. R., Trujillo, M.-A. and Guzman, A. (2015) Governance of Family Firms, Annual Review of Financial Economics, 7, pp. 35–54. Vo, D. H. and Nguyen, T. M. (2014) The Impact of Corporate Governance on Firm Performance: Empirical Study in Vietnam, International Journal of Economics and Finance, 6 (6), pp. 2-13. Yusof, N. Z. M. (2016) Context Matters: A Critique of Agency Theory in Corporate Governance Research in Emerging Countries, International Journal of Economics and Financial Issues, 6(S7), pp. 154-158.